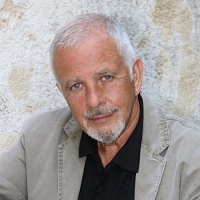 An Eastender in more ways than just being an ex-resident and publican on the award-winning shouty TV soap, David Essex has, what they may exclaim on his home-turf, made good. The son of a docker and of Irish travelling blood, his rise to stardom and the trappings of fame was astronomical some 40 years ago - and this all happened some 10 years after cutting his first single in 1963, 'And the Tears Came Tumblin' Down'. So, by the time that his first huge international hit 'Rock On' appeared on Top of the Pops, David Essex was already smart enough to know that eschewing his then band The Mood Indigo was the right move. During the next 10 years, Essex became something of a pop-idol, to put it mildly. His fresh-faced boyish smile evoked press adoration and considerable hysteria amongst any female from 8 to 80. It's as though a template was suddenly created for the term 'cheeky chappy' and David Essex was 'it', as well as being a regular alternative to another Jackie cover star at the time, David Cassidy. 'Gonna Make You a Star', 'Stardust', 'Hold Me Close', 'Oh What a Circus' and 'Silver Dream Machine' racked up more sales than most of his contemporaries, with a few written especially for stage-shows or films. His connection with the large and small screens has continued throughout his career - only recently, Essex was appearing in and producing his successful semi-biographical musical, 'All the Fun of the Fair' and signing off from a 6-month appearance in Eastenders as Eddie Moon, bringing the whole thing full circle to his next activities - a book and a tour. The book, entitled 'Over The Moon' (see what he did there? ), closes many chapters in his life and opens another due to start in the autumn - The Rock Tour. This lengthy jaunt around many UK theatres and halls will see David Essex perform his familiar classics from the past four decades, as well as a few surprises. With an army of loyal fans, you can be sure that tickets will sell rather like his hits - fast. The calling points include the opening night in York on 25th October, followed by Wolverhampton, Reading, Southampton and dozens more until the final quartet in London (Indig02), Norwich, Bournemouth and lastly Southend on 3rd December. Prices weigh in at £25 upwards with most tickets on sale now.